The latest poverty statistics were released by Statistics Canada last Wednesday, and the data once again shows that British Columbia has one of the highest poverty rates in Canada. 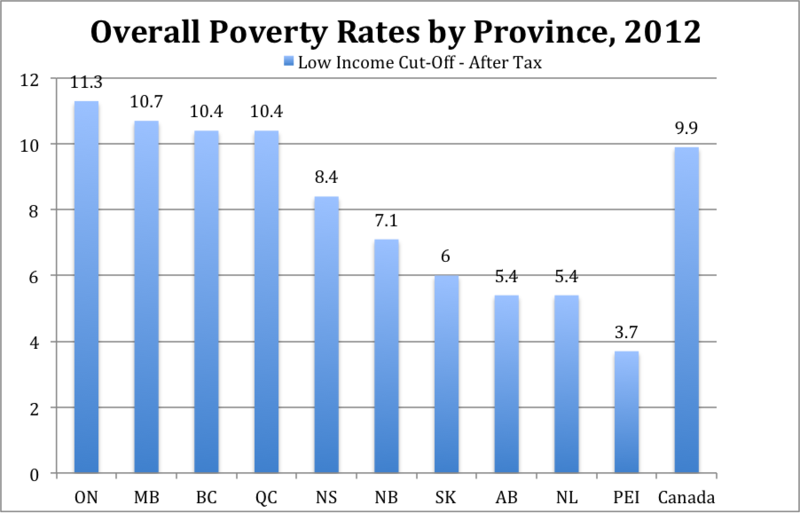 Using the Low Income Cut-Off – After Tax (LICO-AT) as the poverty line, 1 in 10 British Columbians are living in poverty. That’s 469,000 people struggling to make ends meet. In relation to the rest of the country, BC is tied third with Quebec after Ontario and Manitoba. As always, there’s a two-year delay in the data from Statistics Canada so these numbers describe the situation from 2012. However, this year there’s also another challenge with the data – it’s produced from a new survey so we cannot compare to previous years. The silver lining perhaps is that it may stop the government from saying that we’ve seen a dramatic reduction in poverty by choosing their reference year from the past as that which had the highest poverty rate, (neglecting to mention that it spiked due to government cuts at the time). So, we can’t say whether we’re improving or slipping backwards but, whichever way the trend might be going, 1 in 10 people living in poverty should be a concern for government and should drive serious action. While the LICO-AT is a useful measure, in part because it gives us one of the most conservative estimates of poverty and because the government themselves have begun to use it, it has some big problems. For one, the base year from which the relative family expenditure underlying the data is drawn is 1992 and family spending on food, shelter and clothing in relation to their income has changed significantly since then. It also does not capture any geographical changes in the cost of living, which are especially significant in Metro Vancouver. Using the MBM as a poverty line, we find over 1 in 7 British Columbians living in poverty. That’s a shocking 670,000 people. 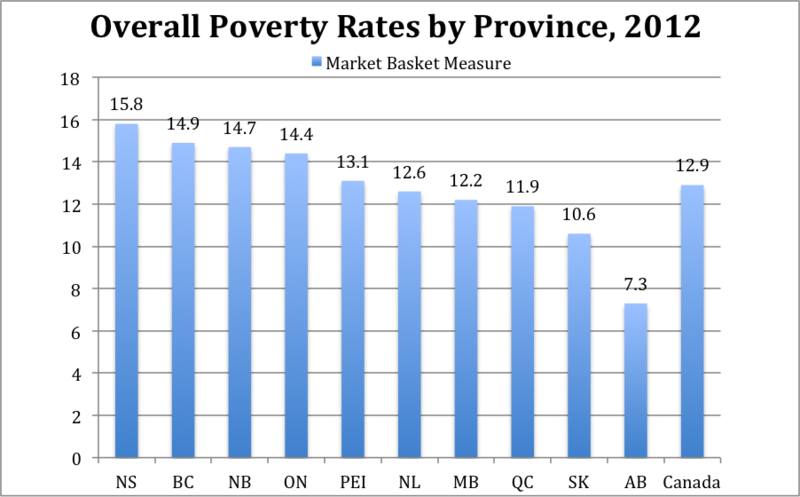 BC now has the second highest poverty rate in Canada after Nova Scotia. Breaking the data down by age reveals a very interesting feature of the landscape of poverty in BC. While BC is in the middle of the pack in relation to other provinces in terms of child and senior poverty rates, we have the very highest poverty rate in Canada for working age people (18-64 years) across all poverty measures provided. This highlights that there is much more support needed for this age group, many of which are the working poor. However, this new survey, as with most others, does not count “persons living on reserves and other Aboriginal settlements in the provinces,” and while these exclusions are said to be less than 3% of the total population, it is worth noting that the age demographics of the Aboriginal population might make this more important in counting poverty among the younger ages. If we add this to the mounting evidence I documented here (in a Vancouver Sun op-ed), including the recently published BC 2014 Child Poverty Report Card based on a different (taxfiler) data source that found 1 in 5 BC children are poor, there clearly continues to be an urgent need for a comprehensive poverty reduction plan for BC with legislated targets and timelines. Despite the numbers and the heart-rending stories behind them, BC is now the very last province without a poverty reduction plan. It’s time for the government to listen up! Trish Garner is the Community Organizer with the BC Poverty Reduction Coalition, a broad-based network of over 400 organizations throughout BC calling on the government to implement a poverty reduction plan. Email the Premier and ask her to take action here. 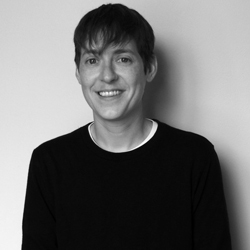 Trish has a PhD in gender, sexuality and women’s studies from SFU and continues to work on LGBTQ issues. She lives with her partner and their three young children in East Vancouver.